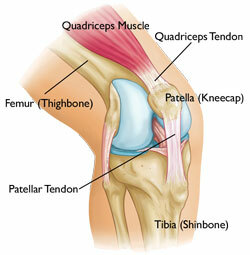 The patella tendon is one of the most important tendons in the knee. The patella plays a major role in the way you use your leg muscles. It helps the knee extend so a person can kick, run, and jump. Patellar Tendonitis is a condition that hundreds of thousands of people suffer through each year. Patellar Tendonitis or “Jumper’s Knee’ as it is more commonly know is when pain can be felt at the patella tendon of the kneecap. 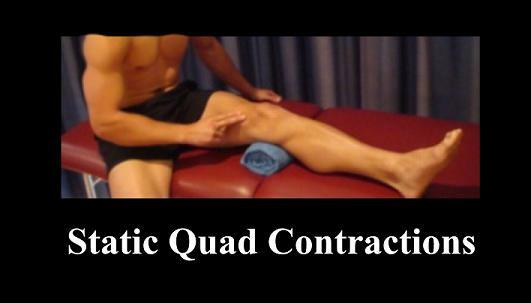 One important muscle when it comes to patellar tendonitis is the Vastus Medialis Obliquus. 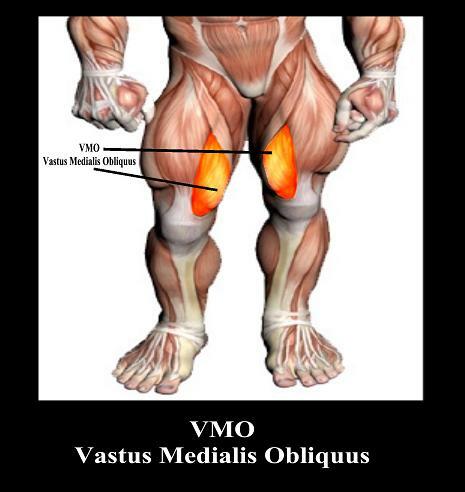 The “Vastus Medialis Obliquus,” or “VMO” muscle is located on the inner thigh. Well developed VMO’s look like teardrops hence the nickname “the teardrop” muscle. The “teardrop” helps keep the knee tracking straight ahead. A weak and or underdeveloped Vastus Medialis cannot provide support to the patella or align the right tracking. This can lead to irritation, inflammation, pain, and tendonitis. Ever seen someone do a squat and their legs buckle in and wobble? It is because their VMO”s are not doing their share of work to provide support. The way to fix this is to build up the ability of the VMO. Since you want strength and stability the first thing you want to make sure of is that you are choosing unilateral movements. It takes more strength and stability to do things one leg at a time so this way of doing things should be implemented with VMO training. Three great exercises for VMO strengthening are Static Quad Contractions, Terminal Knee Extensions, and Resistance Band Knee Extensions. Lay down on your back. Tighten the muscle at the front of your thigh (quadriceps) by pushing your knee down into a rolled towel or foam roller. Put your fingers on your inner quadriceps to feel the muscle tighten during contraction. Hold for 5 seconds and repeat 10 times as hard as possible pain free. Tie a resistance band around an immovable post and then looped the other end behind the knee cap which is slightly bent. The knee is then slightly flexed and fully extended, while focusing on squeezing the quadriceps. Hold for 5 seconds and repeat. 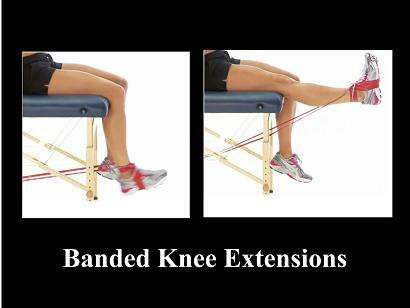 Begin this exercise in sitting with your knee bent and a resistance band tied around your ankle. Keeping your back straight, slowly straighten your knee tightening the front of your thigh (quadriceps). Then slowly return back to the starting position. Perform 3 sets of 10 repetitions provided the exercise is pain free. A second area that is overlooked with patellar tendonitis is the hamstring muscles. The hamstrings work opposite of the quads by helping bend the knees during contraction. If the hamstrings are too tight the range of motion of the knee is decreased, causing more stress on the patella tendon. If your hamstrings seem to constantly be tight, then you are going to want to add more hamstring stretching to your routine. If your hamstrings seem to tire easily and are weak, then you’re going to want to add more strengthening exercises. A great stretch for the hamstrings is the Reclined Hamstring Stretch. Lie on your back, bend your right knee and place your right foot on the floor. Raise your left leg as high as you can keeping your pelvis flat on the ground. Hold your lower thigh and encourage the leg to move toward your head. Flex your foot to stretch your calf too. To deepen the stretch, place a yoga strap or towel on the ball of your foot and use your hands to pull the strap toward you. After 30 seconds, switch legs. If you’re looking to strengthen your hamstrings look into doing Stiff Leg Deadlifts. Stiff Leg Deadlifts are great because they really strengthen the hamstrings. Stiff Leg Deadlifts require good balance and hip mobility so they will also do a pretty good job at stretching the hamstrings and improving hip mobility. For being just one movement the Stiff Leg Deadlift offers a lot of different benefits. Since the goal is prehab or rehab a ton of weight is not needed. · Grasp a bar or pair of dumbbells using an overhand grip (palms facing down). · Stand with your torso straight and your legs spaced using a shoulder width or narrower stance. The knees should be slightly bent. This is your starting position. · Keeping the knees stationary, lower the barbell to over the top of your feet by bending at the hips while keeping your back straight. And hamstrings stiff. Keep moving forward as if you were going to pick something from the floor until you feel a stretch on the hamstrings. · Start bringing your torso up straight again by extending your hips until you are back at the starting position. · Repeat for several reps. Remember not to round the back and to keep the legs stiff. Rounding the back will put unneeded stress on the back. The legs should not be fully locked out but have a minor bend and remain still thru the movement. Patellar Tendonitis or “Jumpers Knee” is a condition that takes thousands of people out of physical activity each year. Patellar tendonitis can occur from many ways so be sure you have an understanding of what may have caused your tendonitis so you can begin the healing process the right way. A lot of times when tendonitis rehab is begun, only one area is focused on and sometimes it may not be the right area. Make sure you are focusing on the right area or areas for strengthening and stretching for a more complete rehab to your tendonitis.